1903 ADMIRALTY OFFICIAL 1d SCARLET, SG 0102, Overprint, Type L9, tied to OHMS Envelope to London by a very fine SHEERNESS cds. 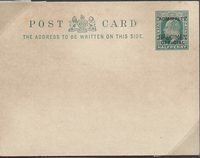 1903 ADMIRALTY OFFICIAL ½d BLUE-GREEN POSTCARD, CO6, Overprint Type 1. Scarce. 1901 I.R. OFFICIAL, SG O3 on O.H.M.S. Mourning Envelope. 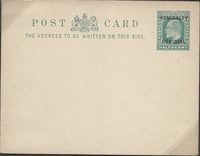 1903 ADMIRALTY/OFFICIAL ½d BLUE-GREEN POSTCARD Overprint, Type 'a' and 'SPECIMEN', TYPE 14. A VERY SCARCE 'SPECIMEN' CARD.